The other day, I posted a graphic showing the evolution of U.S. federal government revenue. Last year, the feds took in a total of $3.2 trillion, mostly from income / social security taxes and corporate income tax. This figure, $3.2 trillion, represents the total amount of explicit costs that the government imposes on the public. 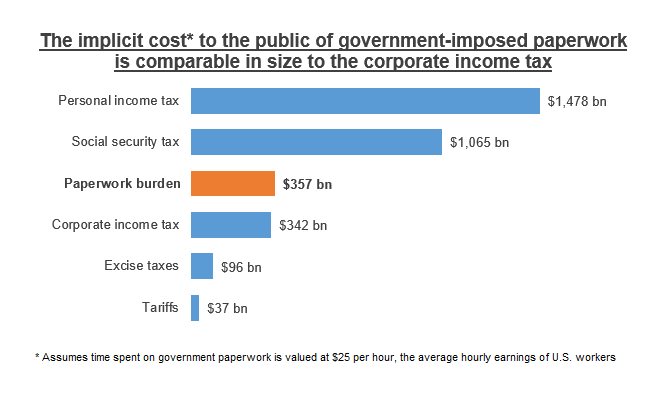 However, the government also imposes some large implicit costs, such the “inflation tax” it extracts by printing money. This post is about another implicit cost that the U.S. government imposes on the public, one that is surprisingly large: paperwork. Any time you fill out a government form, that has a cost in terms of time. And in some cases, such as when you hire an accountant to prepare your income tax return, it may also have an out-of-pocket monetary cost. Still, government paperwork may seem like nothing more than an occasional nuisance, and for most people it probably is. But when viewed as a whole, including information that the government collects from businesses, the public’s overall paperwork burden is likely larger than you think. If you have ever filed your own taxes, you may have come across the table below in the 1040 tax form instructions sheet. As the table shows, the average individual tax filer can expect to spend 8 hours and $110 preparing and filling out their primary tax form. Those who are self-employed can expect to spend substantially more. These cost estimates were not produced by the IRS purely as a courtesy to tax filers. And they are not unique to the 1040 tax form. The Paperwork Reduction Act of 1995 requires the government to provide cost estimates like these for all government forms, as well as any other case where it collects information from the public. 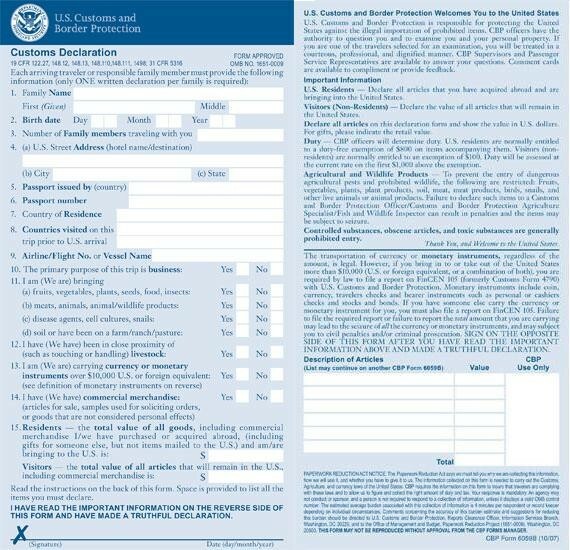 For example, you may be familiar with the customs declaration form, which you fill out at the airport after arriving from outside the country. Here is what the government estimates as its paperwork burden. And below is what the government estimates for a passport application. There is not much to the form itself, so I assume most of the time and all of the money are spent getting the passport photos. Other than tax forms, none of government forms I’m familiar with jumped out as being a major hassle. However, scanning down the full list, there are some whose time and monetary burdens are difficult to make sense of. Here is what it costs auto manufacturers to submit documentation in connection with the Federal Motor Vehicle Theft Prevention Standard. 8,344 hours is the equivalent of four full-time employees working on nothing but this documentation for an entire year. And that’s to say nothing of the $2.5 million expense! The government has no incentive to inflate these numbers, so I trust they are reasonable estimates. But I still have a hard time imagining what such a document could even look like. If you would like to see the full list of government forms / information collections, they are posted at the Office of Information and Regulatory Affairs website. Some of them are pretty interesting to dig into, but what I found most striking of all is the total when you add them up. These figures, which come directly from the OIRA, represent the total time and money spent by citizens and businesses in responding to government requests for information. Here are some comparisons to put these numbers in context. In total, U.S. adults spend an estimated 11.5 billion hours each year preparing information for the government (including time spent by employees on behalf of businesses). If the entire employed U.S. labor force were to put their jobs on hold and work on nothing but government paperwork, completing it would take about 10 working days, or their full paid vacation time. The chart below shows how that number compares to the total hours U.S. adults spend on other activities, based on the 2014 American Time Use Survey. In addition to the time burden, government paperwork imposes a monetary cost of $69 billion per year. Here is how that number compares to what Americans spend each year on various products, based on the 2014 Consumer Expenditure Survey. The two charts above show the time and monetary burdens separately. But looking at it another way, you can combine them into a single number. The average U.S. worker earns about $25 per hour, so if the public were paid for the 11.5 billion hours spent on government paperwork, the cost would come out to roughly $288 billion. Add to that the $69 billion of actual monetary costs, and you get a single estimate that represents the total cost to the public of preparing government paperwork: $357 billion. The time and money spent on government paperwork is not an actual tax. But like a tax, it is a real cost that the U.S. government imposes on the public (contrast with the U.K., where the government files your taxes for you). So, just for fun, here how $357 billion compares to what the U.S. government collected last year in actual federal taxes. Of the total $357 billion implied paperwork cost ($69 billion and 11.5 billion hours), IRS forms account for $257 billion ($34 billion and 9 billion hours). If nothing else, that’s strong argument in favor of simplifying the tax code. Spending on alcohol and tobacco is a bad thing. Maybe the government should give more paperwork. We sure do have a big government.